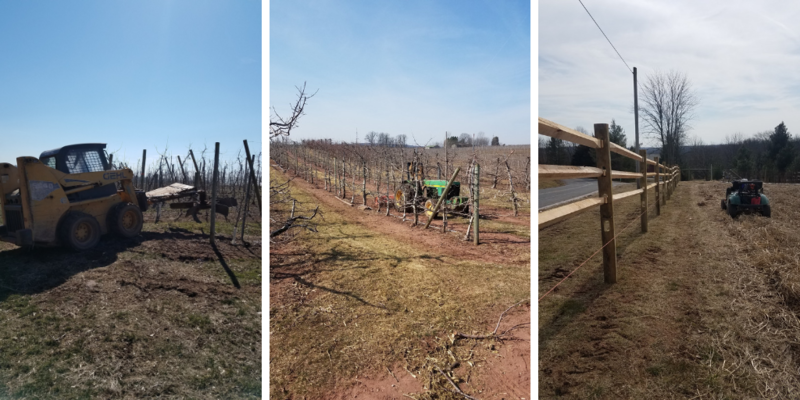 This winter and spring, we’ve been busy getting ready for the pick-your-own season, which will start with strawberries at the end of May or beginning of June, depending on weather and ripening. Here’s a brief overview of what we’ve been doing this winter and early spring as we await pick-your-own. 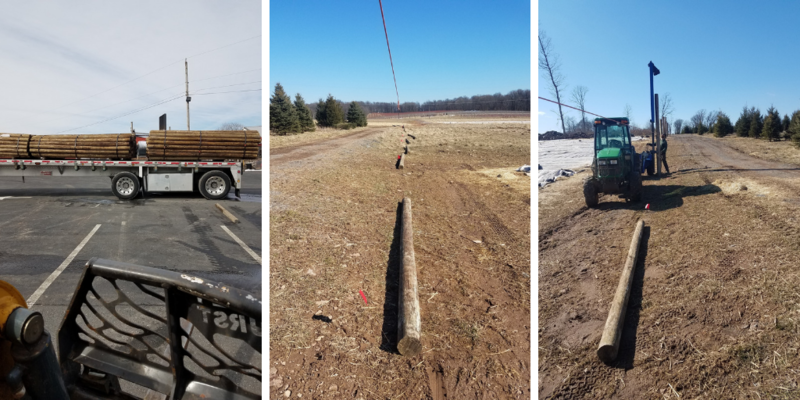 Getting posts in place for our new deer fencing. 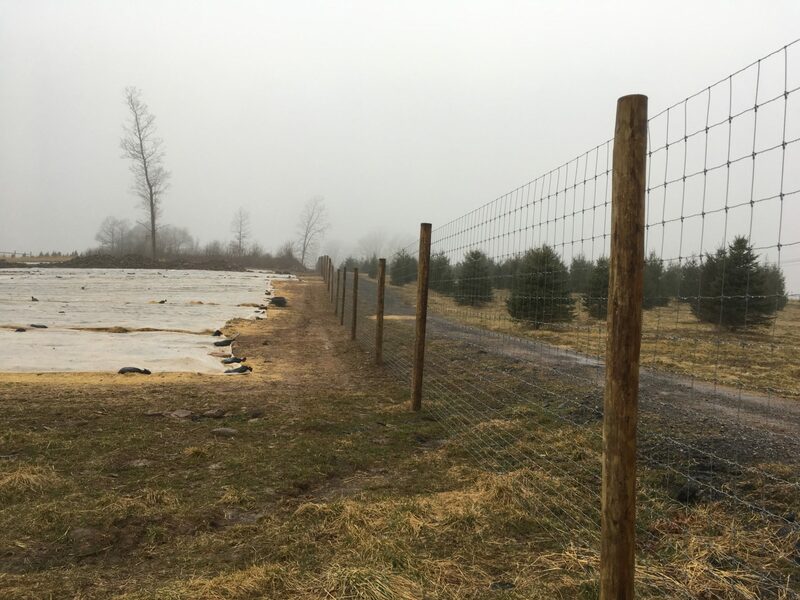 “We have been continually trying to add more deer fence every year, when possible. Deer can cause a lot of problems. Not only will they eat the fruit and leaves, they eat the fruit buds during the winter time. In this way, a deer could eat hundreds of apples in one night by eating the buds in the winter time. “As many people know, the buck will also rub trees in the fall, but even the doe can be fairly destructive on young trees, breaking branches to try to pull down the most tender leaves, sometimes on small trees even breaking off the whole tree. “They also love strawberry leaves in the fall, so these pictures show us adding some fence by the strawberry fields. Sweeping brush out from under the trees with the loader and chopping brush with the tractor. 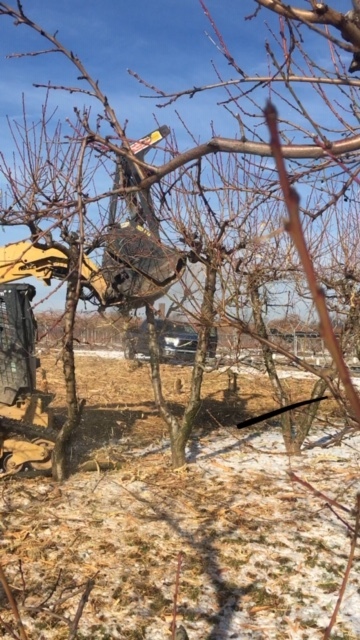 “After we prune the trees, we go through with the loader and brush sweeper to sweep the brush out from under the trees into the middle of the row, then we come through with the tractor and chopper to grind up the branches into smaller pieces. “Most every year we plant some new trees and remove some old trees. Sometimes this is more visible than others, depending on where on the farm it happens. Peach trees have an average lifespan of 15 to 20 years, while apples can have a lifespan of 20 to 40 years. 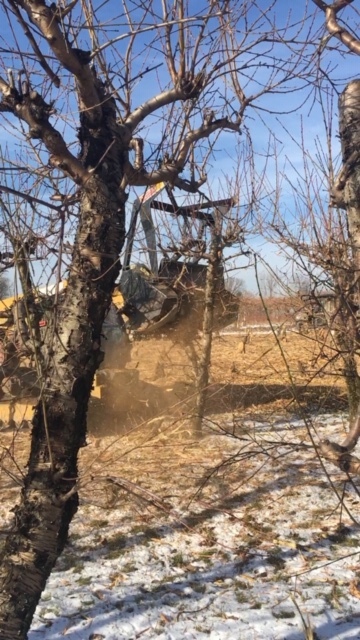 On average, we figure an expected lifespan of 20 years for our trees; therefore we need to average planting 5% of our farm every year and removing 5% of the oldest or least productive trees every year. All together, these factors mean that “we have been on a slightly accelerated replant schedule the last few years,” says Justin. We are looking forward to seeing you for pick-your-own season in a few months! In the meantime, be sure to follow us on Facebook and subscribe to our newsletter for updates!